Why did Google AdSense rejected my application? It is the question that daunting every Blogger who want to be publisher of Google AdSense. The rejection always make us disappointed in some level. Apply for Google AdSense is easy as you apply for an email address, or even it is much easier. You only need to put your website address on the submission page and waiting for the approval. The hardest part is wating for the approval. In fact the approval is not easy as it might has been imagined by many beginner blogger. Sometime beginner blogger take this process so light and do not pay attention in Google AdSense Policy or never read other user experience before submitting Google AdSense application. The Google AdSense approval process can be a short and easy process or it can be long and full of uncertainty process. It will depend on your blog quality. You you can ask your self to check whether your blog is qualified for Google AdSense. There are some question that you can ask before submitting Google AdSense. Do you have enough quality content on your blog? Do your blog generate organic traffic? Do your blog follow Google Policy? You can find more detail explanation on the previous article in this blog talking about things to consider before submit Google AdSense. 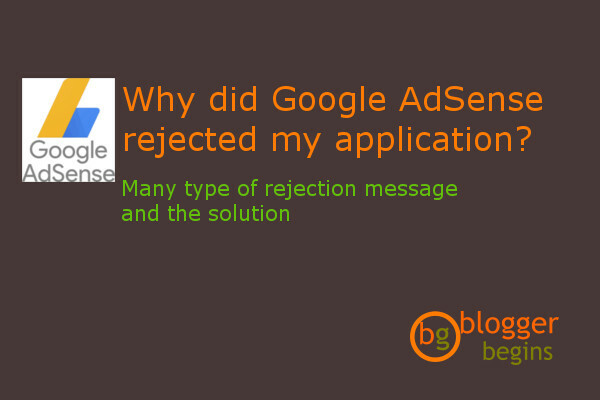 If your Google AdSense application was rejected, usually Google AdSense send you a rejection message. Don't worry this is not the end of the road. You only head a road block in a way to be Google Publisher. Google AdSense will help us in resolving the rejection. Google AdSense will give the reason of rejection and ask us to improve the blog. After we have improved the blog as Google AdSense suggestion, we can re-submit the blog for Google AdSense application. In this post i would like to share different aspect of Google AdSense application. This is the painful aspect of Google AdSense application process. It is the Google AdSense rejection message that I've got until my account was approved. I have received several rejection message from Google AdSense before. I'll share on this post to give you an idea of what kind of rejection message that you might got if your blog does not meet the Google AdSense qualification. I'll share also what is the Google AdSense approval message like. This message below is the sweet welcoming message from Google AdSense after we sign up. The message might be different right now but the content i believe is quite the same. You now what? I've received this message in 2009. I use one of my blog talking about photography that contain many of my photographs. It was not adequate content to apply for Google AdSense. I'm still a beginner at that time and you should avoid the same mistake i did. I've got this message twice. I thought this message is reached me because i do not have proper menu on my blog. I put a nice menu on my blog to help user navigate. And then i re-submit again the blog. I've got the second message telling me the same thing. I realized that i have changed my blog to custom domain for the blog that i have submitted for Google AdSense before. I though I've make mistake here. I should not changed the name of blog that i used for Google AdSense. By changing the blog name to custom domain, Google crawler will be re-directed to our custom domain when crawl our original blog name. I've realized that my change to get approval from current Google Account is zero. My account will never be approved due to this mistake. Please avoid the same mistake i did. I have to create another Google Account and submit different blog. The problem is, i created all of my blog in the same Google Account. So i can not registered the other blog. The solution is very easy eventually. I just need to transfer the blog to new Google Account. It is very easy. For detail problem and solution can be found in the article below. I had submitted a new website with new Google Account. That time, i submitted the complete blog with navigation and a lot organic traffic. So i'm sure my application will be approved in a short time. In fact, the reality is not the same with expectation. My application was rejected again. And the rejection message i received from Google AdSense is : "Site does not comply with Google policies". They said that, Google AdSense goal is to provide the advertiser the site that offer rich and meaningful content and receive organic tragic. Your site should also provide a good user experience through clear navigation and organization. I received this email on Sept 4th, 2017. All the suggestion seems doesn't fit my situation. But i consider the general notification. It said that my blog has content does not comply with Google AdSense policy. I tried to search the article that might violated Google AdSense policy. I think one of my article does fit with this category. This article talking about the way to download video from Youtube. Google seems does not like it. Finally i removed this article and resubmit the blog. Google give us notification that they are setting up our account and said usually it will take less than a day to get notification. I've got this message below. The reality it took more than one a day. In my case I've got full approved notification after a month. This waiting process without any certainty was agonizing process. We do not know whether our blog will be approved or rejected and we can not do anything about it. It is only waiting. I've write my experience about this waiting process in previous article of this blog. Google said "We're working on setting you up"
4. Google AdSense approval message. Finally after a month from my re-submission, my application was finally approved. I've got this message. It is a big relief. This is the first step to become Google Publisher. As summary and conclusion, Google rejected our Google AdSense application because of our blog does not meet qualification of Google AdSense. The blog content may be is not sufficient to generate organic traffic, or the content is not follow Google AdSense policy or other technical problem like site navigation. Google AdSense is an ad program, it need visitor. To do so, our blog need organic traffic and visitor. But don't worry, if your application was rejected, you can always resubmit the blog. Just make sure that you have already improved your blog and is in a better condition than your blog in previous submission. I hope this article may help you in the process of Google AdSense application. Thank you for reading. Please share/like if you find this information is useful and worth sharing. 1 Response to "Why did Google AdSense rejected my application"